Chickadees are small black, white and gray birds that flit from place to place. The male, female, and immature birds all look alike. Described as friendly or cheery, chickadees are the darlings of the backyard birdfeeding world. Chickadees tend to feed one at a time because there is a hierarchy that allows the most dominant bird to feed first. 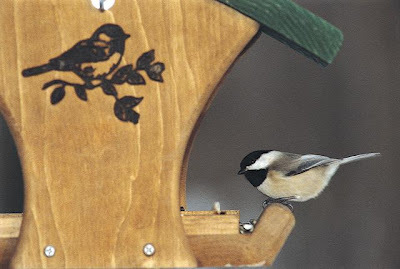 Generally, chickadees take one seed from the feeder – sometimes choosing with care to get the heaviest seed – and they fly away to eat it and return for more. Their favorite foods at the feeder are peanuts, suet, mealworms, sunflower, and safflower seeds. They will also forage for insects, small caterpillars, spiders, snails, slugs, centipedes, flower seeds, and berries. Chickadees are very vocal as they call to their mate to announce food or a warning. 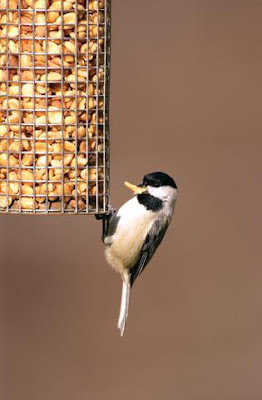 Because chickadees generally do not migrate, they are good at finding food sources and other birds such as nuthatches and woodpeckers sometimes join them in foraging for food. They have particularly strong legs that let them hang upside down while searching for food.